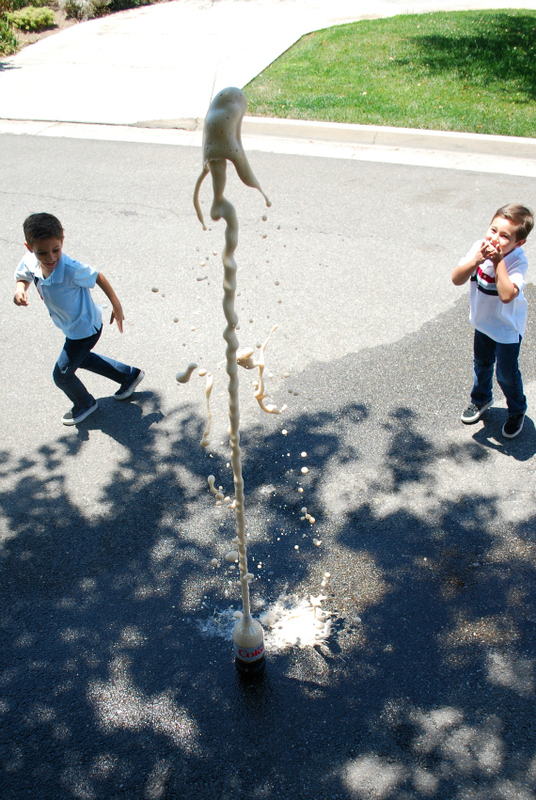 I mentioned last week that the cola bombs were the highlight of Mikey’s birthday party. They were so much fun! 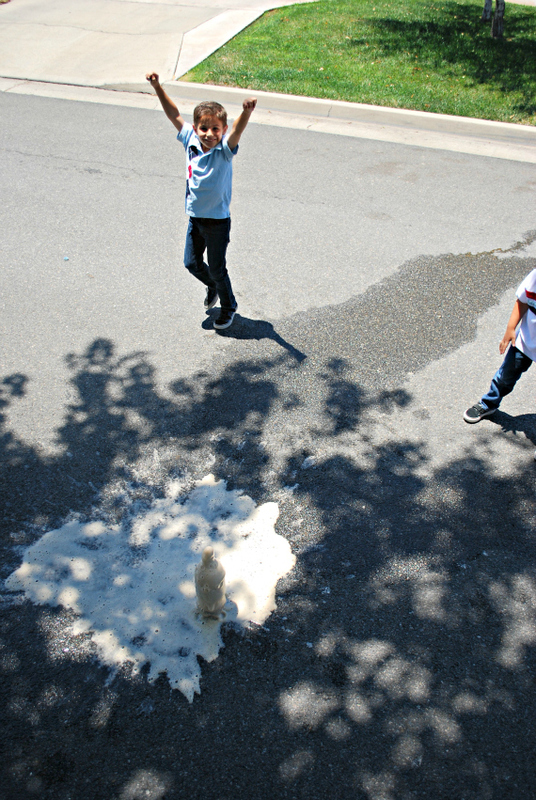 Cola bombs (aka: Cola Geysers, Mentos Bombs, Soda Rockets, etc.) are easy to make and all over the internet. A few of you asked me last week how we made them, and while I can direct you to the thousands of pages and youtube videos with directions, I thought I would toss out a tip we learned from Mikey’s 1st grade teacher the day of the party. It’s a total lifesaver, especially if you’re setting off several bombs at once or in succession like we did. 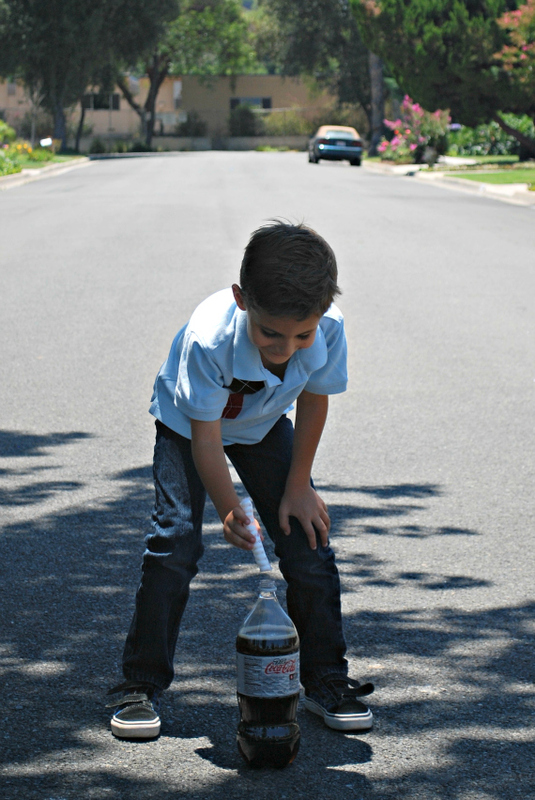 This tip also allows little ones (preschoolers) to participate without getting diet coke in their eye. Probably. 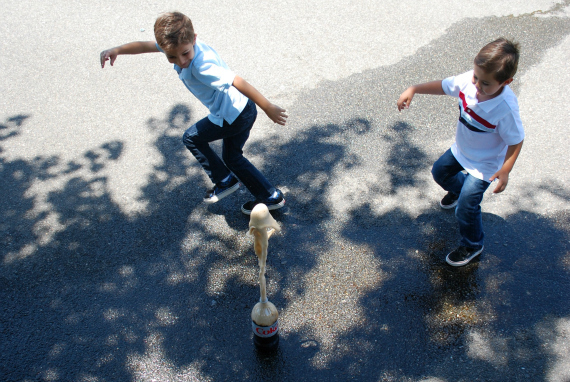 Most tutorials suggest you use a card and tube to funnel the Mentos into the Diet Coke. You place the card on top of the bottle, the tube on top of the card, and then quickly slide out the card like a trap door and let the Mentos fall in. That works, but not well. 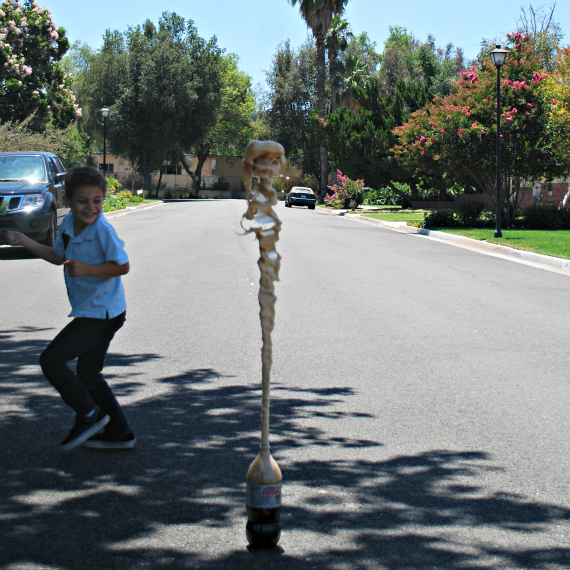 We found the paper tubes were flimsy in little hands and not all the Mentos made it inside the bottle. Sometimes the bottle falls down. You have to be quick and limber! There are kits you can buy online, but…no. First, go outside! You don’t want to do this inside, though there are plenty of pranksters on Youtube that recommend otherwise. 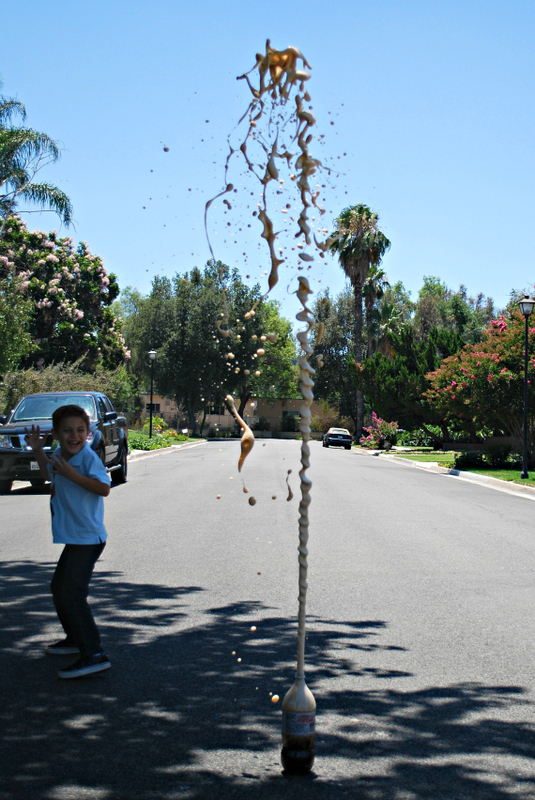 Next, unroll your pack of 12 Mentos and gently place a strip of scotch tape along the top. 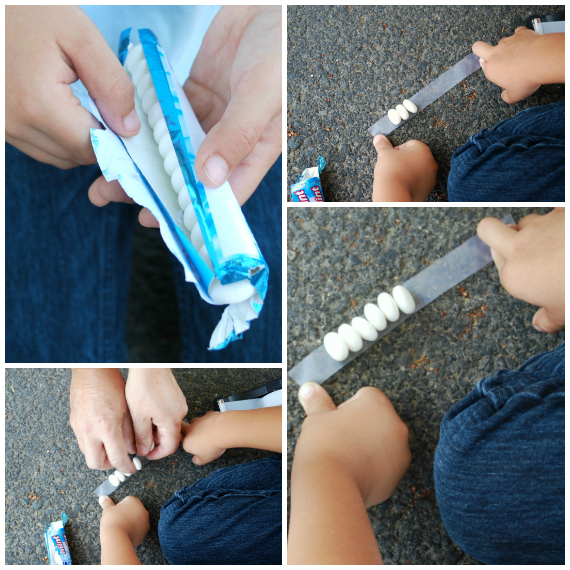 You can also lay the tape sticky side up on a hard surface and place the 12 Mentos individually. They will stand up! 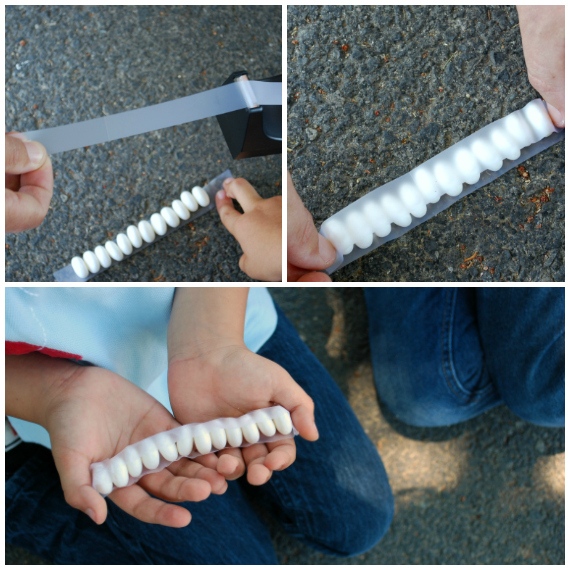 Place another strip of tape on top and lightly press the candy into a makeshift cylinder. You want the tape to barely hold the Mentos in place. See how only a miniscule portion of each Mentos candy touches the tape, and that two sides are completely clear of tape? You need plenty of surface area for the Diet Coke to seep in and around the candy. Carry your roll of candy like a baby bird to your open 2L bottle of Diet Coke. If you want, you can spill out about 1 cup of the Diet Coke on the ground. Your bomb will be smaller and it will give little ones more time to run. Drop it in. 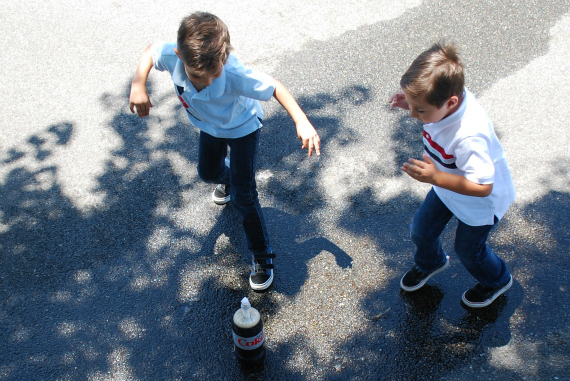 The scotch tape makes it pretty simple, but you still have to beat feet once the candy hits the soda! Shall we try that from another angle? Yes, lets. 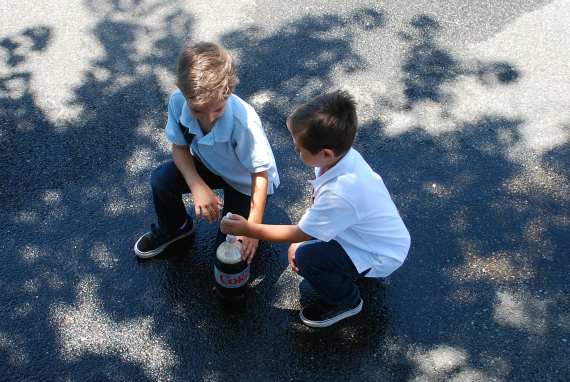 Thanks to the scotch tape, 5 year old Nicholas can be in charge of setting off the Cola Bomb. 4th of July is on Wednesday, so you all have to do this with the kids and the adults. We set off these bombs in front of our neighbor’s tree. She laughed and laughed, partly because it’s fun to see something harmless explode on purpose, and partly because the joyous screaming and dancing by Mikey and Nicholas was infectious. “You guys just made my day,” she said as she walked inside, still laughing. I believe it. You just can’t be in a bad mood after watching soda shoot 15 feet into the air. Love high photo. And the expressions! LOVE IT! We want to know how you got up so high to take the photos. Standing on car? Climbing tree? Some combination of both while holding camera high above your head? Levitating? Do tell. 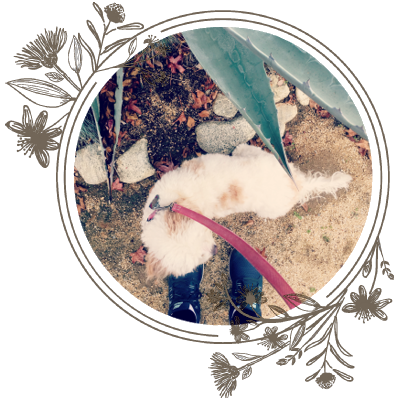 I stood near the top of an 8 ft ladder (my waist was at 8ft) and I was very, very scared�and annoyed because my husband kept teasing me. Kudos to you for facing your fear to get the shot! The progression of their expressions in each photo is priceless! I stood near the top of an 8 ft ladder (my waist was at 8ft) and I was very, very scared…and annoyed because my husband kept teasing me. I am in love. I cannot wait to do this with my husband and out girls. This is so cool. Finally a good use for pop ;) Next Canada Day, I’m totally pulling this one out. Oh, and those photos are the best yet. Can completely imagine the joy and laughter streaming out of those boys, it is infectious. July 1st is Canada Day and obviously these stalwart Canadians were looking for some fun for the big day. Thanks for the tips. these photos just made me so happy! this is an awesome activity! Awesome! We are doing these tomorrow since we have nothing going on and I have a bazillion hours of time to fill in the day with these rascals! We did this the first time over our geraniums, and the next week they exploded! I think they liked all the minty sugar. Wish I’d read the comments, we did ours in the alley because I was afraid ants would invade if I didn’t hose it off afterwards. Saw this posted on the internets and was curious. Totally doing this, this week! This is so cool! 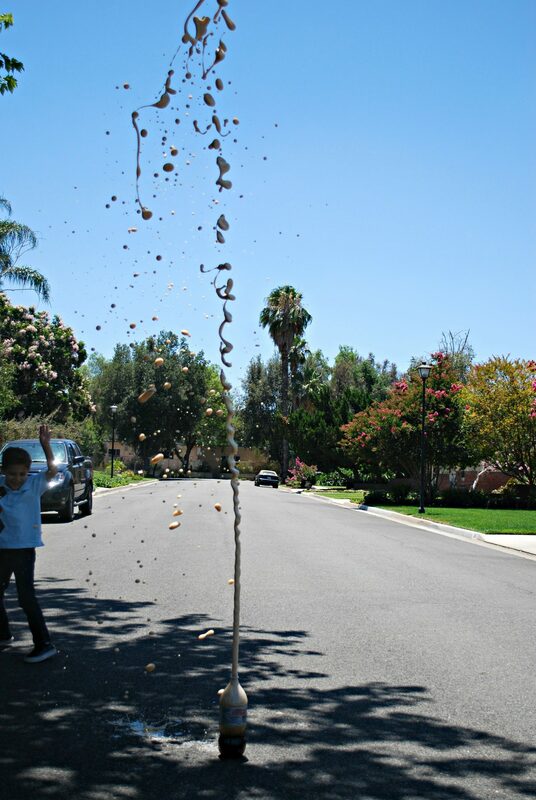 I’m totally doing this with my kids on the 4th! Thanks! Oh wow! My boys will love this. Can’t wait to try it on the 4th. Thanks for sharing and I love the pictures. oh, the joy on those boys’ faces! Thank you!!!! 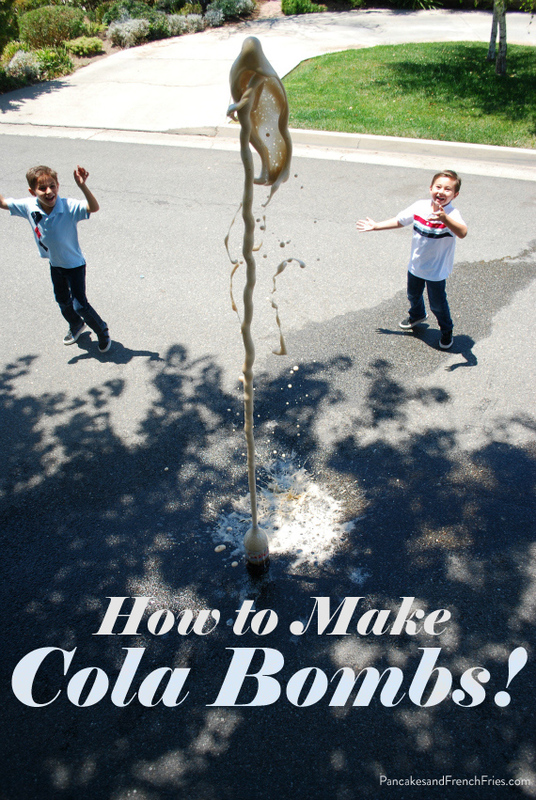 This is a fantastic project to do with kids right before you send them into the sprinklers! I would add that they should be dressed in swimsuits. Thanks for the early morning laugh. Now that, my friend, is a good time! And using tape . . . brilliant! And a fun fact? I work for Steve Spangler’s publisher. Oh wow! A NASA convention! That sounds like a lot of fun. SO fun! And these are fantastic pictures! Will definitely have to try this. Those pictures are AMAZING! Totally worth the ladder and potential threat to life and limb. I guess I’m weird, but I’ve never heard of this! 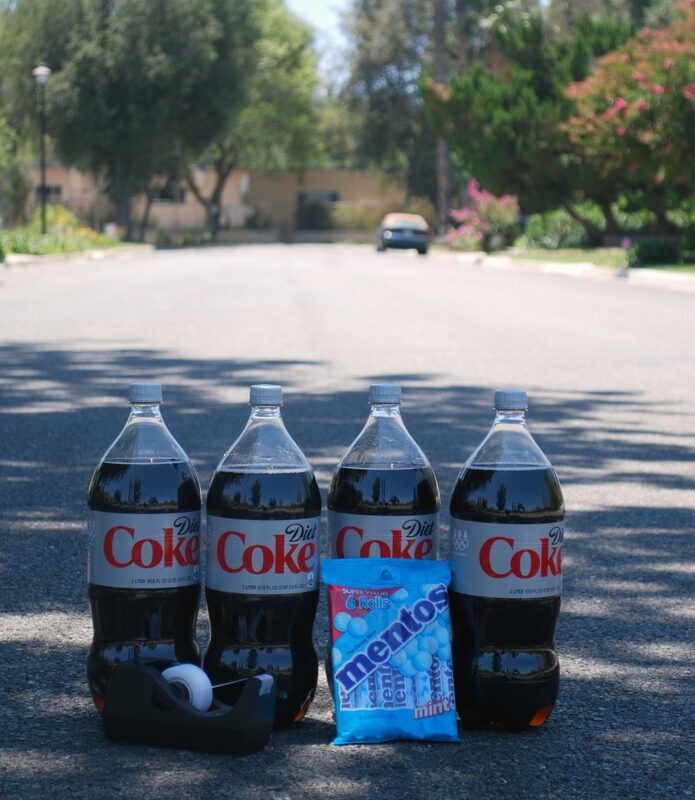 And now I sort of believe that old myth that mentos + diet coke will kill you. I’ve never heard of that myth, but now you have me wondering what it would do in your stomach! Your pictures made my day! They totally capture the story. Way to work the fast shutter speed auto action sequence function thingy on your camera :) Also, I am going to do this with my playful fun loving husband on the 4th. Best use for soda, if you ask me. this looks so fun!!! I need to do this with my kids – will earn major cool mommy points! :) thanks for sharing the tape idea – brilliant! Awesome. I’ll be doing this on Wednesday definitely!! adding this to the festivities tomorrow! hope i remember to take pics. Your kids are phenominally ADORABLE! They are just hilarious to see doing their boy things. On this post, I have to say my favorite picture is the one with Nico’s hands covering his mouth and Mikey’s arms raised in triumph! Classic! I am going to visit my niece and nephew in 2 weeks and will be “baby sitting” them without parental supervision (thier parents supervision) for several days and decided to try this great experiment out. We did this with my kids and a couple others on the 4th of July. Ours didn’t go quite as high is it looks like yours did, but it was great fun! Thanks so much for the “how to,” and for helping out with our fireworks-less 4th!